Hi everyone! I missed making a post on the last two Sundays, so today I’m bringing you a bunch of interesting discoveries that occurred over the last two weeks. Or rather, I am bringing you half of those stories, because there are simply too many to include in one post. I’ll be posting Part II in a day or two, so stay tuned for that. The New Horizons spacecraft was launched from Cape Canaveral on January 19, 2006 with a mission to make a close flyby of objects in the Kuiper belt, the dark outer frontier of our solar system. By far, the most interesting target was Pluto, the erstwhile planet, of which we only had data from distant astronomical observations till now. New Horizons took about thirteen months to reach Jupiter and then used Jupiter’s gravity to get a boost in speed before making a beeline for Pluto. 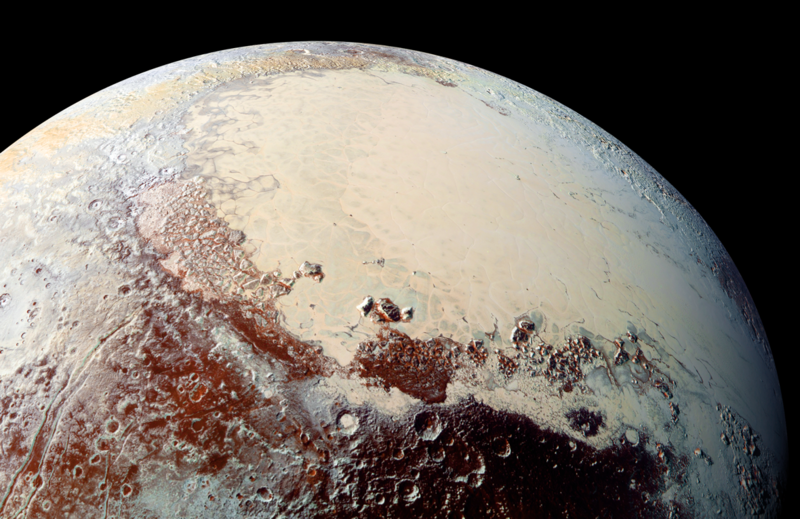 On July 14, 2015, it made its closest approach to Pluto, after having transmitted images and data relating to it for a period of almost six months. This month, the results from the flyby were published in the journal Science, exposing a wealth of new information. For starters, Pluto seems to be unusually geologically active for a planet of its size and status. Its surface is dotted with craters alongside deep features like mountains that can only be formed as a result of tectonic activity and the presence of hard bedrock. The surface of Pluto is covered with nitrogen, carbon monoxide and methane ice, which do not fit the requirement for hard bedrock, and hence this suggests the presence of a harder substance below the surface layer – most likely water-ice. Also, certain parts of Pluto’s surface show really few craters, suggesting that these regions were formed relatively recently – strong evidence for continuing geological activity. Intriguingly, in certain places, the scientists even reported seeing ‘glacier-like’ features. Another surprising discovery was the extent of Pluto’s atmosphere – with an almost 150 Km deep atmospheric ‘haze’ clearly visible above the surface. The surface pressure is low, about 10 microbar (for comparison, atmospheric pressure at the earth’s surface is approximately 1 bar, about 100,000 times that of Pluto). Methane and Nitrogen were among the gases detected. In addition to studying Pluto, New Horizons also took high resolution photos of Pluto’s biggest moon, Charon. Charon also shows evidence of tectonic activities, and has several large craters on its surface. New Horizon also sent back information about two more moons of Pluto – Hydra and Nyx – which are tiny, irregularly shaped satellites, whose highly reflective surfaces indicate that they are mostly covered with water-ice. Till the New Horizons flyby, the highest resolution image we had of Pluto is the one shown on the top left, taken from the Hubble Space Telescope. Compare it to the latest images released by NASA (top right), if you want to know how much the recent flyby has added to our knowledge of this controversial member of our solar system. 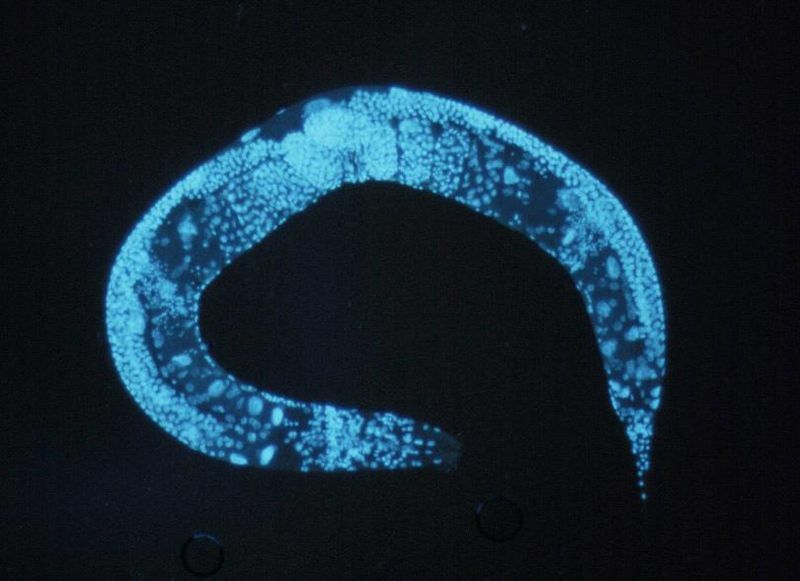 Caenherrobditis elegans is a small soil-living roundworm (also called a nematode) found in temperate zones. In 1974, the famous South African geneticist Sydney Brenner, proposed the use of C. elegans as a model system for studying development in multicellular organisms. Graduate student and part-time science blogger. 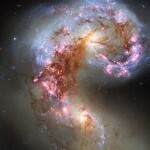 I am currently working on my PhD in neuroscience. In my spare time, I like to indulge my insatiable book addiction, browse the crazy alleys of reddit, and window-shop for gadgets. Thank you for your support and Happy New Year ! Hi! If you have any questions, comments or suggestions, feel free to drop me an email at thescientificlens@gmail.com. I’ll try to get back you as soon as possible.